Photo: Ian McBurnie. CC BY-NC 2.0 (cropped). Lately, British Member of Parliament (MP) Rory Stewart and journalist George Monbiot have been raising eyebrows, and for all the right reasons. Both are extremely passionate and eloquent, both are committed to the rural landscapes of Cumbria and the Lake District — historically considered one of the most beautiful regions of the United Kingdom — and both are currently in a disagreement over what comes next for these landscapes and the people that inhabit them. It’s an important dispute with global relevance, and their upcoming debate in early 2014 will be one to watch. But first a bit of background. 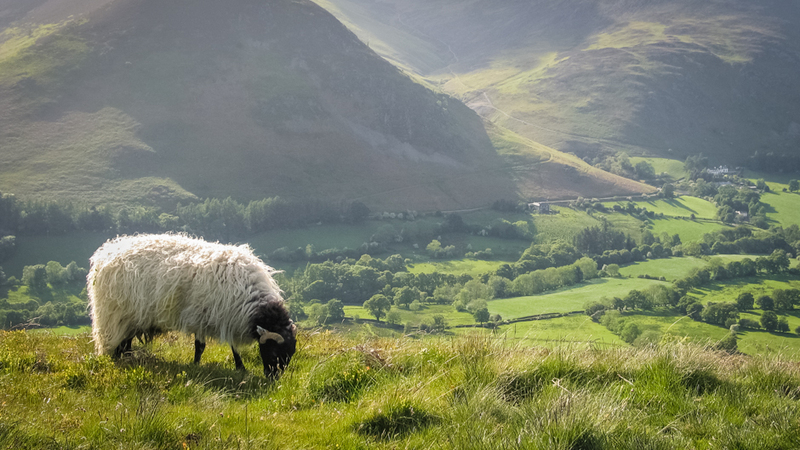 In September 2013, Monbiot, an author and environmental columnist for the Guardian, published a piece characterizing Britain’s Lake District as a “wildlife desert” that had been “thoroughly sheepwrecked” by extensive hill farming. Quoting William Wordsworth, who along with Samuel Coleridge was one of the poets famously inspired by the pastoral beauty of the Lake District, Monbiot implies a misplaced romanticism for agricultural life that continues to define (mis)management of the region, where subsidized and increasingly consolidated sheep farming has transformed the area into “one of the most depressing landscapes in Europe”. In his latest book, Monbiot calls for “rewilding” of large swathes of Britain, and sees the uplands as a particularly appropriate candidate for such activities. Enter Stewart, MP for Penrith and the Border, England’s largest constituency by area with the lowest population density, and home to many of the upland farms and sheep under discussion. Writing just weeks after Monbiot’s piece was published, Stewart champions the “human landscape”, while emphasizing just how many different pressures are contributing to the disappearance of small upland farms, two-thirds of which he says have been lost in the past few decades. Prevailing market forces push towards greater productivity and efficiency, while environmental policies implicitly push for afforestation and the removal of sheep and their shepherds from portions of the landscape. Stewart also emphasizes the role that these human landscapes have played in sustaining highly valuable historical and cultural linkages in the Lake District for over a thousand years. Despite their disagreements, I find much to agree with in Monbiot’s and Stewart’s writing. If communities leave too heavy of a footprint on their landscapes, things certainly will not end well. But at the same time, smallholder farmers living in (romanticized? imagined?) harmony with nature are often envisioned as a panacea, or cure-all, that promises sustainability in the face of many of the negative trends evident in today’s world. Landscapes of the past or landscapes of the future? But why should we care about what happens to some sheep farmers in a remote corner of Britain, far from the front lines of catchier environmental stories like the disappearing Amazon rainforests, China’s sinking coastal cities, or rampant poaching to feed the illicit ivory trade? For me (and I imagine Monbiot and Stewart may agree), the core question is whether the communities, traditions, and production activities (in Cumbria or elsewhere) that have shaped landscapes over generations have a place in the 21st century, or if they will ossify, crumble and be swept away by the pressures of the day. The continued existence of such communities, however, is clear evidence for some deeper resilience founded on sustainable practices and management. Considering that the World Bank estimates that the cost of disasters has quadrupled in the last 30 years, resilience is an increasingly valuable commodity. But while the immediate value generated by production activities can be calculated with a fair degree of accuracy, and the price tags of hurricanes, earthquakes and other disasters are always tallied after the fact, how can a price be put on things like tradition, culture or biodiversity? Nevertheless, it is precisely such ingredients that seem to be combining with others to produce resilient systems, and which are being weighed against the very tangible costs of service delivery in sparsely populated areas, reduced short-term profit margins, etc. But even if a price were to be put on the loss of a single species of beetle, a regional dialect, or a community festival, surely a threshold would eventually be reached at which the cumulative loss would far outweigh the sum of the parts. If the foundation erodes around the roots of a culture, it may also be swept away like any other part of the landscape, leaving behind a gap that cannot be easily filled. Over-measuring and over-managing — surviving the tyranny of metrics? Policymakers, economists, researchers and more have clearly embraced the frequently quoted maxim that one cannot manage what one does not measure. But as stated above, just how well does this really fit a dynamic biological system or coupled socio-ecological systems with rich traditions that have evolved over generations? The past decades have seen tremendous growth in the range of tools and databases available to measure everything from tangible quantities like crop yield and CO2 emissions to largely intangible concepts like resilience and happiness. But despite this wealth of metrics, harmonious human-nature interactions often seem to lie somewhere in a hazy past. The germplasm feeding the world today, for example, is largely the product of countless generations of anonymous farmers who lacked the tools to plot supply and demand curves, predict the paths of hurricanes, or quantify their happiness, equality, corruption, etc. The alarming present rate of loss of agrobiodiversity underscores just how rapidly this resource, developed over millennia, can dissipate without a nurturing human hand. At the same time, it is a testament to the deep and continuous activity of humans to shape the landscape around them. Is it merely coincidence that an era characterized by so many examples of poor environmental and ecosystem management is also one distinguished by an embarrassment of riches in the form of a multitude of metrics, indicators and models? Romanticizing rural life is nothing new. In his Georgics, published over 2,000 years ago, Roman poet Virgil sings the praises of animal husbandry, farmers and beekeepers, while warning of the corruption found in cities. The picture isn’t always so rosy though. Today, many rural communities around both the developed and developing world are shrinking due to rural-urban migration, depopulation and ageing populations. In comparison with densely populated cities, this causes disproportionate increases in costs associated with education, healthcare and other essential services delivered by the state. Stewart and other politicians representing rural constituencies are in the difficult position of having to choose how to allocate funds most effectively within such a context, where the decision to close a rural school, for example, could have momentous and potentially irreversible impacts on the community’s future. An interesting part of Monbiot’s article points to romanticization of Cumbrian landscapes by poets of yore, and particularly the Lake District’s current lobbying to be inscribed on the United Nations Educational, Scientific and Cultural Organization (UNESCO) list of World Heritage Sites. If embraced too tightly, such historical adulation and future recognition, he argues, could make wise management of the landscape even more challenging. At the same time, World Heritage designation can lead to substantial new revenue flows, as demonstrated, for example, in a 2009 analysis of the potential socio-economic gains/losses that the Lake District could accrue, drawing in part on insight from studies of other World Heritage Sites. And though overreliance on a romanticized past could create inertia, I can’t help but consider poetry in praise of a landscape as a source of strength and as some warm distillation of our awe for the world and connection with it. It was encouraging to recently read that Stewart and Monbiot have agreed to continue this discussion with an in-person debate to be held in early 2014. The core issues couldn’t be more fundamental or relevant considering both the unprecedented flows of people around the world from rural to urban areas, and the continuing pressures associated with global markets, environmental policies and more. I’m looking forward to seeing how the conversation continues to develop. Champions of Cumbria’s (Human) Landscapes by Robert Blasiak is licensed under a Creative Commons Attribution-NonCommercial-ShareAlike 4.0 International License.